I write to you having just returned from a wonderful retirement celebration for Gijs Mom, one of our founders, which is described further in a separate section. I want to begin, then, by offering many thanks to Gijs for his dedication to building this organization, serving as its President and on its Executive Committee for many years, and as editor of the Journal of Transport History and founding editor of the journal Transfers, thus helping to build this field and create its professional institutions. In honour of this transition, the Executive Committee have decided to award him a lifetime honorary membership as a sign of our thanks and hope that he will continue to be involved in our activities! The occasion was held at Eindhoven University of Technology, with thanks to organizers Ruth Oldenziel, Frank Schipper, Martin Emanuel, and many other scholars in attendance who are also T2M members. Alongside the event there were two workshops, one on Urban Cycling, and the other on the relation between “smart mobility” and “sustainable mobility” as concepts and practices. This brought together lively debates on technology, history, transitions, mobility practices, cycling, statistics, policy, and cross-national comparisons. It reminded me of the importance of our field to influencing policy makers and guiding urban transitions, and underlined the energy that many new scholars are bringing to it. We have an important role to play in the future of mobilities. And speaking of which, I am also very happy to welcome on board our new Secretary of T2M, Julia M. Hildebrand, who has graciously transitioned into this role as we bid farewell to Nathalie Wachotsch. Thanks to Nathalie for her excellent service! And welcome to Julia who is a PhD Student in Culture, Communication and Media at Drexel University, with extensive international travel experience and fluency in German and English, and is also Research Assistant on the Imagine Trains project. So please look for future communications from Julia. Plans for the 2015 T2M conference in Italy, on the 14-17th September, are coming along nicely. The Program Committee has reviewed more than 85 paper submissions, and more than 15 panel submissions, a very strong turnout with excellent quality. We are happy to announce a keynote address by Canadian Research Chair of Mobility Studies, Kimberly Sawchuk, who works especially on mobile media and disability studies, two areas important to future mobilities. We also welcome a plenary panel bringing together several interdisciplinary research teams studying mobility transitions and mobility futures, including my own Imagine Trains research team, as well as geographer Peter Adey, sociologists Sven Kesselring and Malene Freudendal-Pederson, and anthropologist Noel Salazar. We will be sending out acceptances and registration information shortly. We encourage everyone to register as soon as possible to take advantage of the “early bird” rate and help us with the planning. The Local Organizing Committee, led by Federico Paolini of the Second University of Naples, with experienced assistance from our Vice-President Massimo Moraglio and other members, meanwhile have been putting together wonderful plans, including hotels, meals, and a choice of excursions in this lovely area. We are looking forward to seeing you all at a very pleasant gathering in Santa Maria di Caserta. I was recently invited by Ruth Oldenziel to attend the retirement celebration for Gijs Mom, and I want to offer a brief account of the event. In an entourage of family, friends, colleagues from Eindhoven University, and several members of T2M, we marked the occasion with several speeches. The first was made by Georgine Clarsen, connecting remotely from Australia, who commented especially on the significance of Gijs’ scholarship in re-shaping transport history, and in particular his new book Atlantic Automobilism. Then I myself made some comments on his significant role as a founder of T2M; as editor of key journals including the Journal of Tranport History and the new journal Transfers; and as a mentor and scout for new talent in the field, helping to support many younger scholars. I also commented on the impact of his scholarship in connecting transport history to the wider currents of the cultural turn and the mobilities turn. And lastly Matthieu Flonneau made comments on their long friendship and some fun times together. Gijs himself then presented some memories and mementoes to several colleagues at Eindhoven, and later in the evening he was toasted by Johan Schot and Ruth Oldenziel, as we enjoyed a Chinese dinner and musical accompaniment. We then enjoyed a more personal slide show of some wonderful moments in his life, both at work and at play, put together by his partner Charly. We all especially admired their next move to a villa in the south of Spain! 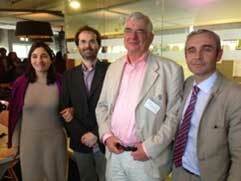 Loisa Sousa, Massimo Moraglio, Gijs Mom and Matthieu Flonneau. Gijs Mom presenting his book “Atlantic Automobilism” to Johan Schot. 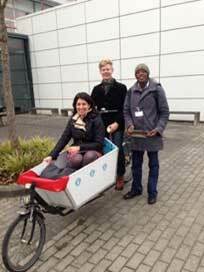 President of T2M Mimi Sheller in a Dutch Cargo Bike with Martin Emanuel pedaling and Yusuf Umar Madugu.